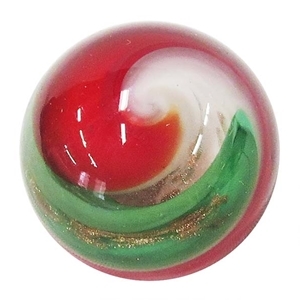 MoonMarble.com - *Bruce Breslow - " Christmas Aventurine Swirl"
Art Glass → Contemporary Handmade Marbles → *Bruce Breslow - " Christmas Aventurine Swirl"
This is a handmade marble by Bruce Breslow. This is a swirl style marble in Christmas colors and flecks of copper aventurine. Approximately 1 1/2" shy in diameter. Signed and dated.